For electric vehicles other than battery powered vehicles, see electric vehicle. For passenger electric vehicles, see electric car. For the batteries themselves, see electric-vehicle battery. A battery electric vehicle (BEV), pure electric vehicle, only-electric vehicle or all-electric vehicle is a type of electric vehicle (EV) that uses chemical energy stored in rechargeable battery packs. BEVs use electric motors and motor controllers instead of internal combustion engines (ICEs) for propulsion. They derive all power from battery packs and thus have no internal combustion engine, fuel cell, or fuel tank. BEVs include - but are not limited to - motorcycles, bicycles, scooters, skateboards, rail cars, watercraft, forklifts, buses, trucks, and cars. In 2016 there were 210 million electric bikes worldwide used daily. Cumulative global sales of highway-capable light-duty pure electric car vehicles passed the one million unit milestone in September 2016. As of April 2018[update], the world's top selling highway legal all-electric car in history is the Nissan Leaf with global sales of over 300,000 units, followed by the Tesla Model S with more than 200,000 units delivered worldwide. Vehicles using both electric motors and internal combustion engines are examples of hybrid electric vehicles, and are not considered pure or all-electric vehicles because they cannot be externally charged (operate in charge-sustaining mode) and instead they are continually recharged with power from the internal combustion engine (ICE) and regenerative braking. Hybrid vehicles with batteries that can be charged externally to displace some or all of their internal combustion engine power and gasoline fuel are called plug-in hybrid electric vehicles (PHEV), and run as BEVs during their charge-depleting mode. PHEVs with a series powertrain are also called range-extended electric vehicles (REEVs), such as the Chevrolet Volt and Fisker Karma. And electric vehicle conversions of hybrid electric vehicles and conventional internal combustion engine vehicles (aka all-combustion vehicles), to one of the two categories. In China, plug-in electric vehicles, together with hybrid electric vehicles are called new energy vehicles (NEVs). However, in the United States, neighborhood electric vehicles (NEVs) are battery electric vehicles that are legally limited to roads with posted speed limits no higher than 45 miles per hour (72 km/h), are usually built to have a top speed of 30 miles per hour (48 km/h), and have a maximum loaded weight of 3,000 lbs. BEVs include automobiles, light trucks, and neighborhood electric vehicles. Chattanooga, Tennessee operates nine zero-fare electric buses, which have been in operation since 1992 and have carried 11.3 million passengers and covered a distance of 3,100,000 kilometres (1,900,000 mi), they were made locally by Advanced Vehicle Systems. Two of these buses were used for the 1996 Summer Olympics in Atlanta. Beginning in the summer of 2000, Hong Kong Airport began operating a 16-passenger Mitsubishi Rosa electric shuttle bus, and in the fall of 2000, New York City began testing a 66-passenger battery-powered school bus, an all-electric version of the Blue Bird TC/2000. A similar bus was operated in Napa Valley, California for 14 months ending in April, 2004. The 2008 Beijing Olympics used a fleet of 50 electric buses, which have a range of 130 km (81 mi) with the air conditioning on. They use Lithium-ion batteries, and consume about 1 kW⋅h/mi (0.62 kW⋅h/km; 2.2 MJ/km). The buses were designed by the Beijing Institute of Technology and built by the Jinghua Coach. The batteries are replaced with fully charged ones at the recharging station to allow 24-hour operation of the buses. In France, the electric bus phenomenon is in development, but some buses are already operating in numerous cities. PVI, a medium-sized company located in the Paris region, is one of the leaders of the market with its brand Gepebus (offering Oreos 2X and Oreos 4X). In the United States, the first battery-electric, fast-charge bus has been in operation in Pomona, California since September 2010 at Foothill Transit. The Proterra EcoRide BE35 uses lithium-titanate batteries and is able to fast-charge in less than 10 minutes. In 2014, the first production model all-electric school bus was delivered to the Kings Canyon Unified School District in California’s San Joaquin Valley. The bus was one of four the district ordered. This battery electric school bus, which has 4 sodium nickel batteries, is the first modern electric school bus approved for student transportation by any state. Thunder Sky (based in Hong Kong) builds lithium-ion batteries used in submarines and has three models of electric buses, the 10/21 passenger EV-6700 with a range of 280 km (170 mi) under 20 mins quick-charge, the EV-2009 city buses, and the 43 passenger EV-2008 highway bus, which has a range of 300 km (190 mi) under quick-charge (20 mins to 80 percent), and 350 km (220 mi) under full charge (25 mins). The buses will also be built in the United States and Finland. Tindo is an all-electric bus from Adelaide, Australia. The Tindo (aboriginal word for sun) is made by Designline International in New Zealand and gets its electricity from a solar PV system on Adelaide's central bus station. Rides are zero-fare as part of Adelaide's public transport system. For most of the 20th century, the majority of the world's battery electric road vehicles were British milk floats. The 21st century saw the massive development of BYD electric trucks. In March 2012, Smith Electric Vehicles announced the release of the Newton Step-Van, an all-electric, zero-emission vehicle built on the versatile Newton platform that features a walk-in body produced by Indiana-based Utilimaster. BYD supplies DHL with electric distribution fleet of commercial BYD T3. A battery-powered electric car is an automobile which is propelled by electric motors. Although electric cars often give good acceleration and have generally acceptable top speed, the lower specific energy of production batteries available in 2015 compared with carbon-based fuels means that electric cars need batteries that are fairly large fraction of the vehicle mass but still often give relatively low range between charges. Recharging can also take significant lengths of time. For journeys within a single battery charge, rather than long journeys, electric cars are practical forms of transportation and can be recharged overnight. Comparison of EPA-rated range for model year 2016 and 2017 US electric cars rated up until July 2017. Tesla vehicles included are the variants with the longest and shortest range for each model. Electric cars are having a major impact in the auto industry given advantages in city pollution, less dependence on oil and combustion, and scarcity and expected rise in gasoline prices. World governments are pledging billions to fund development of electric vehicles and their components. The US has pledged US$2.4 billion in federal grants for electric cars and batteries. China has announced it will provide US$15 billion to initiate an electric car industry. Cumulative global sales of highway-capable battery electric cars and vans passed the 1 million unit milestone in September 2016. The Renault-Nissan Alliance is the leading all-electric vehicle manufacturer. The Alliance achieved the sales milestone of 350,000 all-electric vehicles delivered globally in August 2016. Ranking second is Tesla Motors with over 139,000 electric cars sold between 2008 and June 2016. As of December 2016[update], the world's top selling highway capable all-electric car in history is the Nissan Leaf, released in December 2010, with global sales of more than 250,000 units, followed by the Tesla Model S with more than 158,000 units delivered worldwide. Ranking next are the BMW i with about 65,500 units, and the Renault Zoe with 61,205 units, both through December 2016. Until June 2016 the Mitsubishi i-MiEV family ranked fifth with about 37,600 units delivered globally. The Renault Kangoo Z.E. utility van is the leader of the light-duty all-electric segment with global sales of 25,205 units through December 2016. Formula E is a fully electric international single seater championship. The series was conceived in 2012, and the inaugural championship started in Beijing on 13 September 2014. The series is sanctioned by the FIA. Alejandro Agag is the current CEO of Formula E.
The Carbon Intensity of electricity can largely vary, depending on the electricity mix of the geographic region where electricity is consumed (a Country with high shares of renewables in his electricity mix will have a low C.I.). In the European Union, in 2013, the Carbon Intensity had a strong geographic variability, but in almost all the Member States Electric vehicles were "greener" than conventional ones. On average, Electric car saved 50%-60% of CO2 emissions compared to diesel and gasoline fuelled engines. Moreover, the de-carbonisation process is constantly reducing the GHG emissions due to the use of Electric Vehicles. In the European Union, on average, between 2009 and 2013 there was a reduction of the electricity Carbon Intensity of 17%. In a Life-cycle assessment perspective, considering the GHG necessary to build the battery and its end-of-life, the GHG savings are 10-13% lower. Special-purpose vehicles come in a wide range of types, ranging from relatively common ones such as golf carts, things like electric golf trolleys, milk floats, all-terrain vehicles, neighborhood electric vehicles, and a wide range of other devices. Certain manufacturers specialize in electric-powered "in plant" work machines. Three-wheeled vehicles include electric rickshaws, a powered variant of the cycle rickshaw. The large-scale adoption of electric two-wheelers can reduce traffic noise and road congestion but may necessitate adaptations of the existing urban infrastructure and safety regulations. Pedelecs from the Call a Bike bicycle hire scheme in Berlin. An increasing variety of personal transporters are being manufactured, including the one-wheeled self-balancing unicycles, self-balancing scooters, electric kick scooters, and electric skateboards. The motor controller receives a signal from potentiometers linked to the accelerator pedal, and it uses this signal to determine how much electric power is needed. This DC power is supplied by the battery pack, and the controller regulates the power to the motor, supplying either variable pulse width DC or variable frequency variable amplitude AC, depending on the motor type. The controller also handles regenerative braking, whereby electrical power is gathered as the vehicle slows down and this power recharges the battery. In addition to power and motor management, the controller performs various safety checks such as anomaly detection, functional safety tests and failure diagnostics. Most electric vehicles today use an electric battery, consisting of electrochemical cells with external connections in order to provide power to the vehicle. Battery technology for EVs has developed from early lead-acid batteries used in the late 19th Century to the 2010s, to lithium-ion batteries which are found in most EVs today. The overall battery is referred to as a battery pack, which is a group of multiple battery modules and cells. The battery pack powering modern EVs can have as little as 96 battery cells to as many as 2,976 cells. Electric cars have traditionally used series wound DC motors, a form of brushed DC electric motor. Separately excited and permanent magnet are just two of the types of DC motors available. More recent electric vehicles have made use of a variety of AC motor types, as these are simpler to build and have no brushes that can wear out. These are usually induction motors or brushless AC electric motors which use permanent magnets. There are several variations of the permanent magnet motor which offer simpler drive schemes and/or lower cost including the brushless DC electric motor. Once electric power is supplied to the motor (from the controller), the magnetic field interaction inside the motor will turn the drive shaft and ultimately the vehicle's wheels. 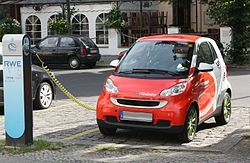 Wikimedia Commons has media related to Battery-powered vehicles. ^ "FAQ". The Boring Company. Retrieved 8 April 2018. ^ "The State of the Electric Bicycle Market | Electric Bike Report | Electric Bike, Ebikes, Electric Bicycles, e Bike, Reviews". ^ a b Shahan, Zachary (22 November 2016). "1 Million Pure EVs Worldwide: EV Revolution Begins!". Clean Technica. Retrieved 23 November 2016. ^ a b Cobb, Jeff (9 January 2017). "Nissan's Quarter-Millionth Leaf Means It's The Best-Selling Plug-in Car In History". HybridCars.com. Retrieved 10 January 2017. As of December 2016[update], the Nissan Leaf is the world's best-selling plug-in car in history with more than 250,000 units delivered, followed by the Tesla Model S with over 158,000 sales, the Volt/Ampera family of vehicles with 134,500 vehicles sold, and the Mitsubishi Outlander PHEV with about 116,500 units sold through November 2016. These are the only plug-in electric cars so far with over 100,000 global sales. ^ a b Cobb, Jeff (31 January 2017). "Tesla Model S Is World's Best-Selling Plug-in Car For Second Year In A Row". HybridCars.com. Retrieved 31 January 2017. See also detailed 2016 sales and cumulative global sales in the two graphs. ^ a b "Tesla Quietly Sold 200,000th Model S Last Year - HybridCars.com". HybridCars.com. 22 January 2018. Retrieved 24 April 2018. ^ a b David B. Sandalow, ed. (2009). Plug-In Electric Vehicles: What Role for Washington? (1st. ed.). The Brookings Institution. pp. 2–5. ISBN 978-0-8157-0305-1. See definition on pp. 2. ^ "Plug-in Electric Vehicles (PEVs)". Center for Sustainable Energy, California. Retrieved 31 March 2010. ^ "What is a neighborhood electric vehicle (NEV)?". AutoblogGreen. 6 February 2009. Retrieved 9 June 2010. ^ "-". Archived from the original on 5 February 2011. Retrieved 30 May 2015. ^ Downtown Electric Shuttle Archived 13 September 2008 at the Wayback Machine. Retrieved 18 August 2008. ^ Electric School Bus. Retrieved 18 August 2008. ^ UNDP donates electric buses to Beijing Olympic Games. Retrieved 15 August 2008. ^ "PVI, leader de la traction électrique pour véhicules industriels". Retrieved 30 May 2015. ^ Chandler, Sara; Espino, Joel; O’Dea, Jimmy (2016). "Delivering Opportunity: How Electric Buses and Trucks Can Create Jobs and Improve Public Health in California". Union of Concerned Scientists. ^ "New All-Electric School Bus Saves California District $10,000+ Per Year". CleanTechnica. Retrieved 1 March 2016. ^ "Electric shuttle buses come to Mountain View, thanks to Motiv and Google". Silicon Valley Business Journal. 13 January 2015. Retrieved 30 May 2015. ^ "雷天温斯顿电池有限公司". Archived from the original on 8 May 2015. Retrieved 30 May 2015. ^ Posner, Andrew (19 December 2007). "When The Sun Shines Down Under. . .It Powers a Bus". TreeHugger. Retrieved 11 March 2012. ^ "Escaping Lock-in: the Case of the Electric Vehicle". Cgl.uwaterloo.ca. Retrieved 27 November 2010. ^ "byd-to-build-electric-trucks-in-ontario". Autotrader.ca. Retrieved 15 November 2017. ^ smithelectric.com (5 March 2012). "Smith Electric Vehicle Launches Production of All-Electric Newton Step Van". smithelectric.com. Retrieved 5 March 2012. ^ bydeurope.com (15 January 2016). "BYD supplies DHL with electric distribution fleet". bydeurope.com. Retrieved 15 January 2016. ^ Energy Efficiency & Renewable Energy, U.S. Department of Energy and U. S. Environmental Protection Agency (24 March 2017). "Find a car - Years: 2016–2017 - Vehicle Type: Electric". fueleconomy.gov. Retrieved 26 March 2017. ^ Krok, Andrew (29 July 2017). "By the numbers: Tesla Model 3 vs. Chevrolet Bolt EV". CNET. Retrieved 29 July 2017. ^ "Should Pollution Factor Into Electric Car Rollout Plans?". Earth2tech.com. 17 March 2010. Archived from the original on 24 March 2010. Retrieved 18 April 2010. ^ "Electro Automotive: FAQ on Electric Car Efficiency & Pollution". Electroauto.com. Retrieved 18 April 2010. ^ "Clean Air Initiative". Archived from the original on 14 September 2016. Retrieved 30 May 2015. ^ Notter, Dominic A.; Gauch, Marcel; Widmer, Rolf; Wäger, Patrick; Stamp, Anna; Zah, Rainer; Althaus, Hans-Jörg (1 September 2010). "Contribution of Li-Ion Batteries to the Environmental Impact of Electric Vehicles". Environmental Science & Technology. 44 (17): 6550–6556. doi:10.1021/es903729a. ISSN 0013-936X. PMID 20695466. ^ "Plug-in Hybrid Cars: Chart of CO2 Emissions Ranked by Power Source". TreeHugger. Archived from the original on 25 March 2010. Retrieved 18 April 2010. ^ "Updated State-level Greenhouse Gas Emission Coefficients for Electricity Generation 1998–2000" (PDF). Archived from the original (PDF) on 28 July 2010. Retrieved 2010-07-16. ^ "Electric Power Monthly - Table 1.1. Net Generation by Energy Source". Eia.doe.gov. Archived from the original on 15 April 2010. Retrieved 18 April 2010. ^ "Less CO2". My Electric Car. Archived from the original on 8 May 2010. Retrieved 2010-04-18. ^ "McKinsey Greater China" (PDF). Archived from the original (PDF) on 16 December 2011. Retrieved 30 May 2015. ^ Palm, Erik (1 May 2009). "Study: Electric cars not as green as you think | Green Tech - CNET News". News.cnet.com. Retrieved 18 April 2010. ^ "Ford says auto future hinges on electric car | freep.com | Detroit Free Press". freep.com. Archived from the original on 21 April 2010. Retrieved 2010-04-18. ^ Martin LaMonica (2 February 2009). "Plotting the long road to one million electric cars". CNN.com. Retrieved 18 April 2010. ^ Terry Macalister (11 April 2010). "US military warns oil output may dip causing massive shortages by 2015 | Business". London: The Guardian. Archived from the original on 15 April 2010. Retrieved 18 April 2010. ^ Macalister, Terry (7 February 2010). "Branson warns of oil crunch within five years | Business". London: The Guardian. Archived from the original on 16 April 2010. Retrieved 18 April 2010. ^ Loveday, Eric (8 June 2010). "ALG predicts gas at $4.13 by 2013; residual values for compacts, hybrids to climb — Autoblog Green". Green.autoblog.com. Archived from the original on 14 August 2010. Retrieved 16 July 2010. ^ "Obama pushes electric cars, battery power this week". USA Today. 14 July 2010. ^ "Freidman OpEd: China's 'Moon Shot' Versus America's". Archived from the original on 3 November 2010. ^ Business Wire (23 December 2015). "The World's Largest Electric Vehicle Maker Also Has a US Presence". BUSINESS WIRE. ^ "Renault-Nissan Alliance hits milestone of 350,000 electric vehicles sold, maintains position as global EV leader" (Press release). Paris/Yokohama: Renault-Nissan Alliance. 13 September 2016. Retrieved 13 September 2016. The Alliance has sold its 350,000th electric vehicle since December 2010, when the Nissan LEAF went on sale. The milestone was achieved in August 2016. ^ Young, Angelo (4 April 2016). "Tesla Motors (TSLA) 1Q 2016 Sales: 14,820 Model S, Model X Cars Were Delivered In First Three Months; Model S Sales Jumped 45%". International Business Times. Retrieved 4 April 2016. Since 2008 almost 125,000 all-electric cars had been sold by Tesla Motors at the end of March 2016. ^ "Tesla Second Quarter 2016 Update" (PDF) (Press release). Palo Alto: Tesla Motors. 3 August 2016. Retrieved 3 August 2016. During the second quarter of 2016 Tesla Motors delivered 14,402 new vehicles consisting of 9,764 Model S and 4,638 Model X. Production during 2Q 2016 totaled 18,345 vehicles. ^ Cobb, Jeff (10 August 2016). "Global 10 Best-Selling Plug-In Cars Are Accelerating Forward". HybridCars.com. Retrieved 13 August 2016. As of June 2016[update], cumulative global sales of the top selling plug-in electric cars were led by the Nissan Leaf (over 228,000), followed by the Tesla Model S (129,393), Votl/Ampera family (about 117,300), Mitsubishi Outlander PHEV (about 107,400), Toyota Prius PHV (over 75,400), BYD Qin (56,191), Renault Zoe (51,193), BMW i3 (around 49,500 including REx variants), Mitsubishi i-MiEV family (about 37,600) and BYD Tang (37,509). ^ Moro A; Lonza L (2018). "Electricity carbon intensity in European Member States: Impacts on GHG emissions of electric vehicles". Transportation Research Part D, 2017. 64: 5–14. doi:10.1016/j.trd.2017.07.012. PMC 6358150. PMID 30740029. ^ "Cleaner Cars from Cradle to Grave (2015)". Union of Concerned Scientists. Retrieved 3 December 2018. ^ Katwala, Amit. "The spiralling environmental cost of our lithium battery addiction". Retrieved 3 December 2018. ^ "AVERA Electric Vehicles". AVERA. Retrieved 19 September 2018. ^ Varma, P. Sujatha (13 April 2018). "AVERA News on The Hindu". The Hindu. Retrieved 14 April 2018. ^ Varma, P. Sujatha (7 October 2017). "City-based firm to launch e-bikes in New Year". The Hindu. Retrieved 8 October 2017. ^ Chi-Jen Yang (2010). "Launching strategy for electric vehicles: Lessons from China and Taiwan" (PDF). Technological Forecasting and Social Change (77): 831–834. Archived from the original (PDF) on 31 March 2010. ^ "Batterifergen har måttet stå over avganger. Nå er løsningen klar". Teknisk Ukeblad. 18 November 2016. Retrieved 19 November 2016. ^ a b c d "How Exactly Do Electric Cars Work?". Green Car Future. 11 November 2018. Retrieved 22 November 2018. ^ a b "Components and Systems for Electric Vehicles (HEVs/EVs)". Hitachi Review. Retrieved 22 November 2018. ^ Crompton, T. R. (20 March 2000). Battery Reference Book (third ed.). Newnes. p. Glossary 3. ISBN 978-0080499956. Retrieved 18 March 2016. Automotive DesignLine Europe, electric and hybrid vehicle design resource for engineers and engineering managers. Zero Emission Workspace, electric vehicles in an off-grid commercial building project. Battery Vehicle Society (UK) and EV Network – the UK national directory of recharging points. The European Association for Battery, Hybrid and Fuel Cell Electric Vehicles (AVERE). EVCanada – Promoting the uptake of Electric Vehicles in Canada. Czech EV Club – (CZ) Eng. section in photogallery. Alternative Technology Association Electric Vehicle Interest Group. "Application of Life-Cycle Assessment to Nanoscale Technology: Lithium-ion Batteries for Electric Vehicles" (PDF). U.S. Environmental Protection Agency. 13 April 2013. Archived from the original (PDF) on 2 December 2013. Retrieved 3 April 2018. "Hybrid and Electric Vehicles - The Electric Drive Gains Traction" (PDF). International Energy Agency (IEA). May 2013. Retrieved 3 April 2018. Lee, Henry; Lovellette, Grant (July 2011). "Will Electric Cars Transform the U.S. Vehicle Market?" (PDF). Belfer Center for Science and International Affairs, Harvard University. Retrieved 3 April 2018. This page was last edited on 19 March 2019, at 18:11 (UTC).